DJI have announced a new stabilised video camera that can fit in your pocket. 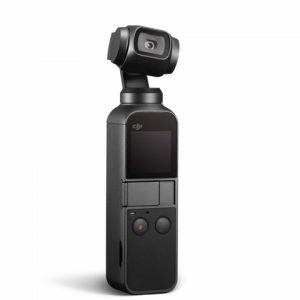 Aptly name the OSMO Pocket, the new product features a drone-like camera which will allow users to film smooth, stable footage and easy to move about. Standing at only four inches tall and weighing only four ounces, it’s the smallest handheld camera DJI have ever designed. That doesn’t take away from its abilities though. Similar to a Go-Pro, the OSMO Pocket can be mounted to a bike or a helmet and can record 4K at 60 frames per second, at a data rate of 100Mb/s. Its three-axis mechanical gimbal adjusts to movement, making any shot smooth and stabilised. It also has face-tracking, active-tracking and just over two hours battery life. Features also include night mode and time-lapse features. Osmo Pocket also uses built-in dual microphones to ensure high quality audio to match your footage. There’s also a tiny colour touchscreen, meaning you can film on the gadget itself or by connecting to your phone. The DJI OSMO Pocket is set to retail in the UK at £329 with options to buy expansive accessories. Written by Paige Collier on Thursday the 29th of November 2018.